The Frazier Preserve includes wetlands and forest right in downtown Gorham, and it is part of the Cross Town Trail. This is a very popular spot for mountain bikers and walkers alike as these peaceful woods are a short walk from Gorham schools and USM. The Frazier Preserve trail also connects with a large network of Town of Gorham managed trails. 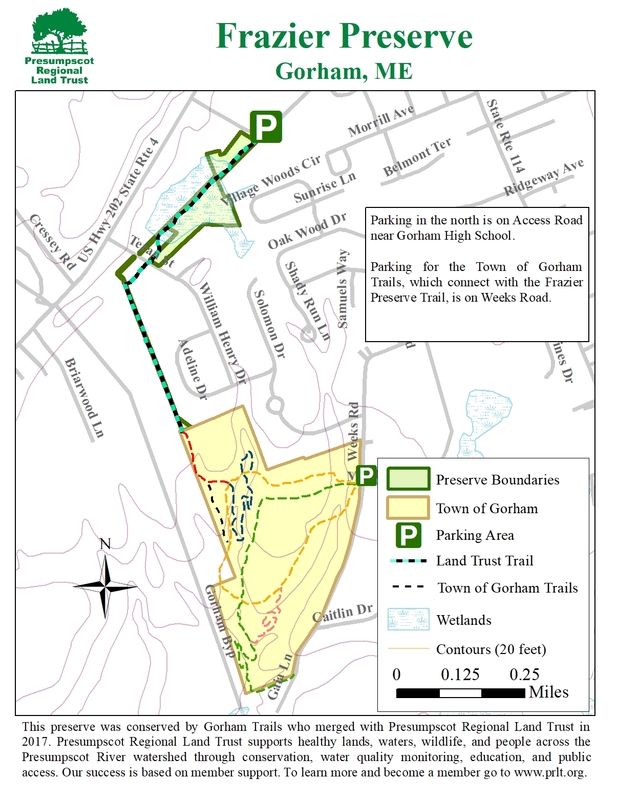 Access to the Preserve is off of Access Road on the way to Gorham High School from Route 202 (near the ballfields). Parking is conveniently located directly at the trailhead. Frazier Preserve was originally conserved and stewarded by Gorham Trails and was incorporated into the Presumpscot Regional Land Trust in 2017. Frazier Preserve is owned in fee by the Presumpscot Regional Land Trust.